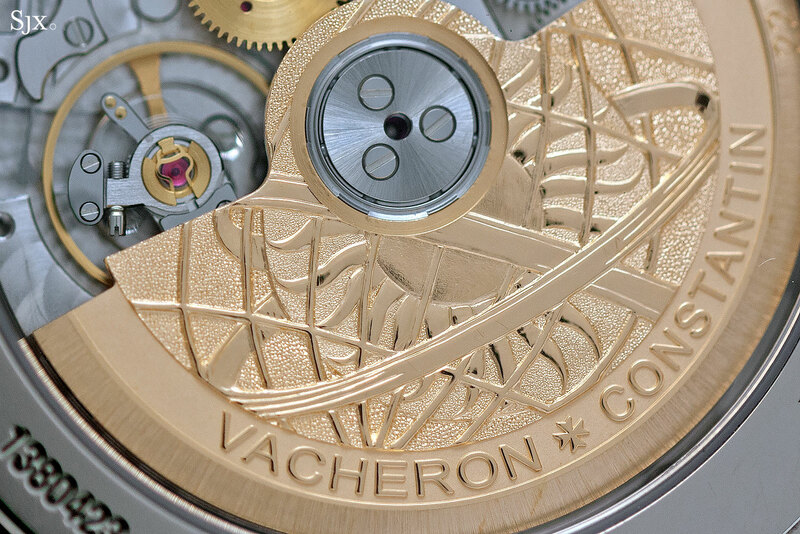 Vacheron Constantin particularly excels in artistic dials with unusual time displays, something that arguably started with the Mercator two decades ago, and continuing today with the charming Les Aérostiers. 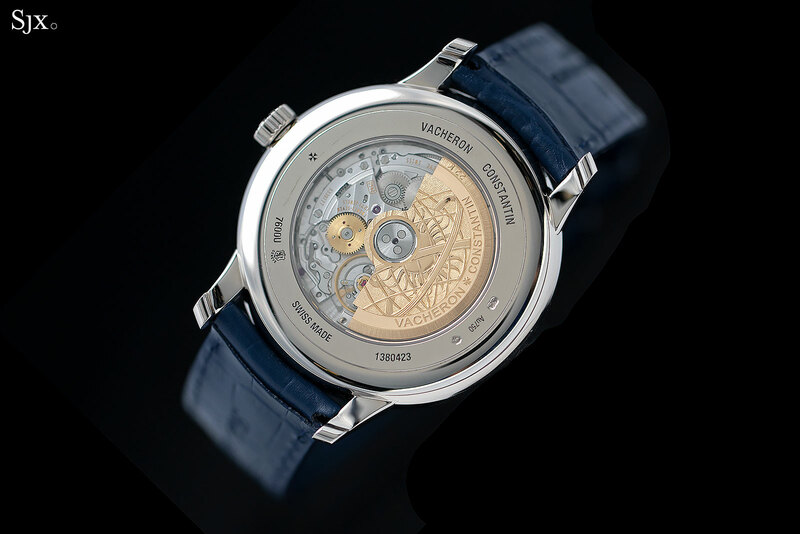 But the most striking, both visually and technically, of the current offerings in this category is the Métiers d’Art Celestial Spheres 2460 RT. 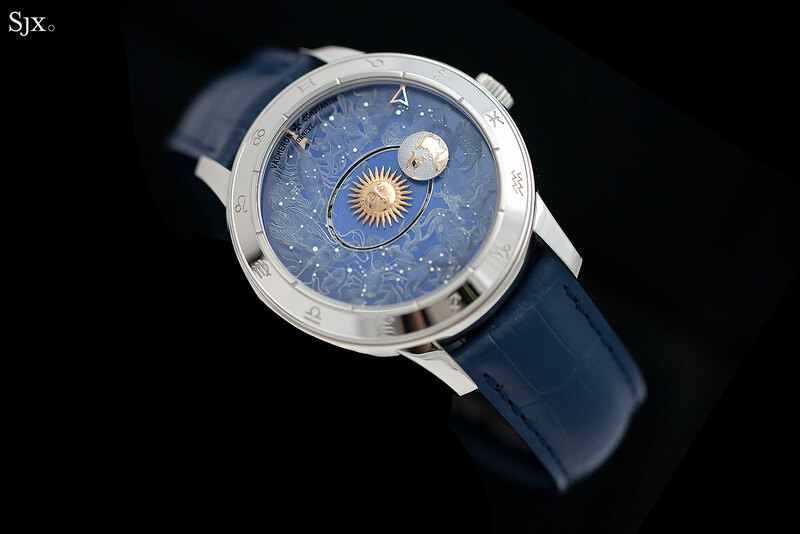 The watch is a nod to Nicolas Copernicus, and consequently has the Sun sitting gloriously right in the centre of the dial, with the Earth orbiting around the Sun. 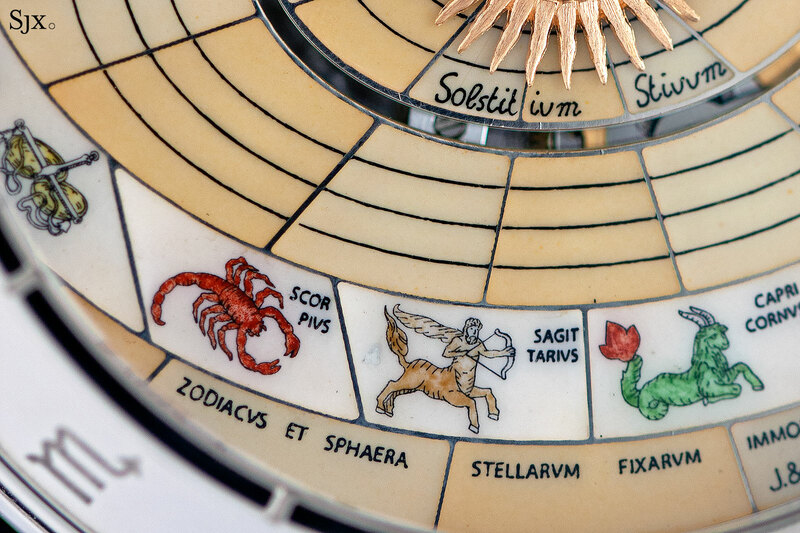 While most astronomical complications tend to look complicated, the Celestial Spheres is discreet and easy to understand, showing the solar year against a beautifully decorated dial. 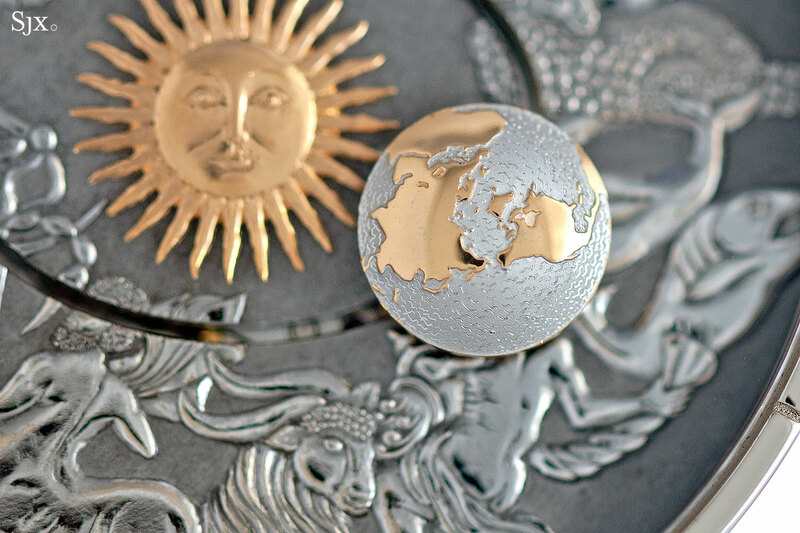 Made of solid pink gold, the Sun is Louis XIV-style, with a hand-engraved face at its centre. 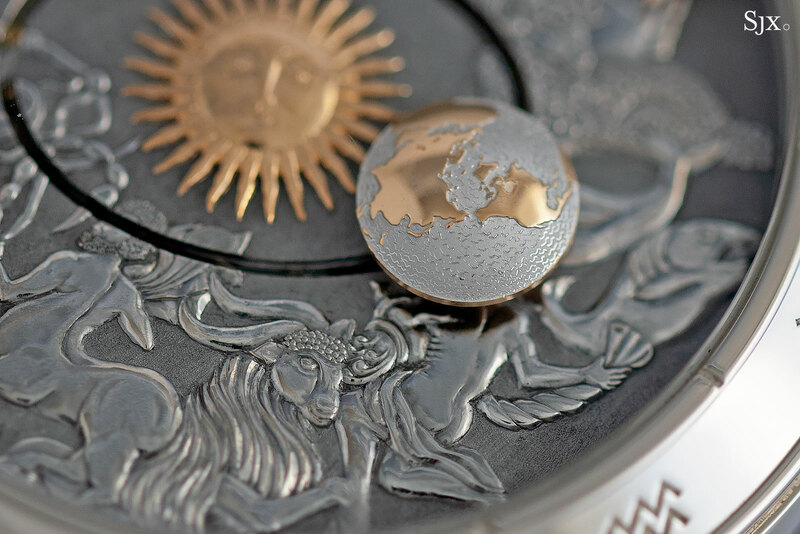 The Earth is represented by a disc showing the continents as viewed from the North Pole – and it is also the unusual complication of the watch. The Earth on the dial moves as it would in real life. It rotates on its own axis every 24 hours, or once a day, making it a day and night indicator of sorts. That represents the mean solar day, which is the time shown on wristwatches based on a 24-hour day. But it also travels around the Sun on a narrow, elliptical track, going around the Sun once every 365.2421898 days, which is a tropical year (or solar year). That’s equal to about 365 days, 5 hours, 48 minutes, 45 seconds. The “tropical” gear train that drives the motion of the Earth around the Sun is accurate enough that will be only deviate by a day after 8000 years. 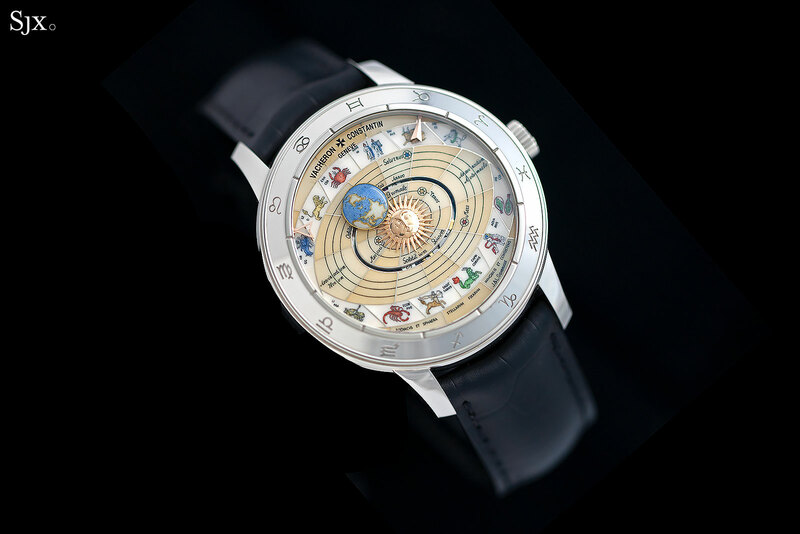 Unsurprisingly, the time is less important than the progression of the heavenly bodies, and so the hands are small arrows that sit on the edge of the dial. An open-worked arrow points to the hours, while the solid arrow is for the minutes; both are made of solid gold. Both are driven by gears on the periphery of the movement, with the central portion of the mechanism dedicated to the “tropical” gear train. The elliptical motion of the Earth on the dial – it essentially travels in an oval over the span of a year – is a particularly complex motion to master mechanically. That’s because the Earth has to travel on two axes to create an elliptical orbit: it makes a large circular rotation around the dial, while at the same time moving away from the centre of the dial and then back again. Consequently, a complex assembly of gears and levers is required to achieve this. Both the time and astronomical display are conveniently accessible and set via the crown. The display is powered by a module that took three years to develop, and sits on top of the cal. 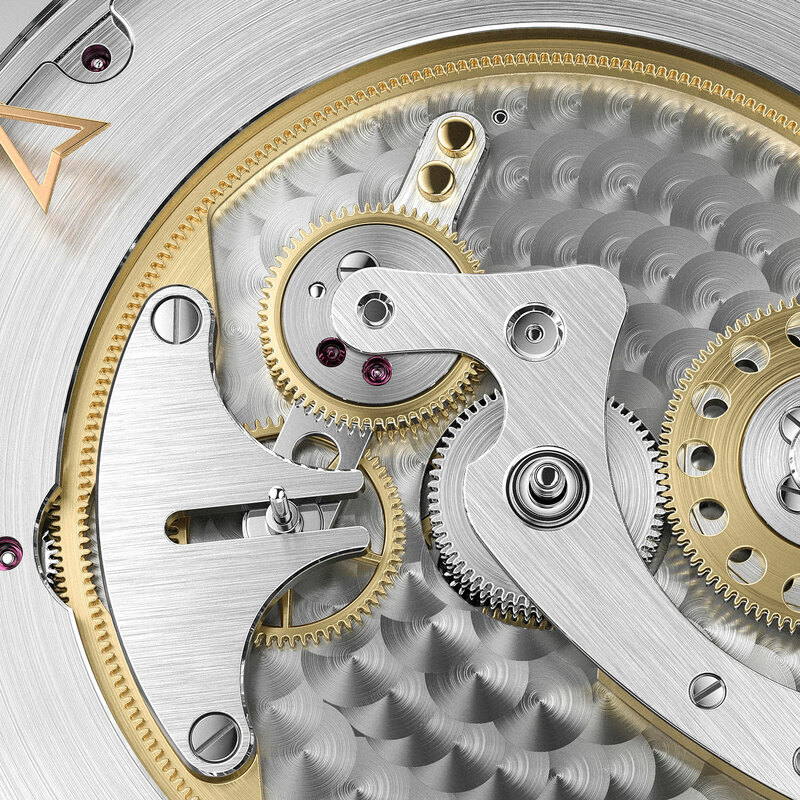 2460, the in-house automatic movement Vacheron Constantin reserves for its high-end watches. 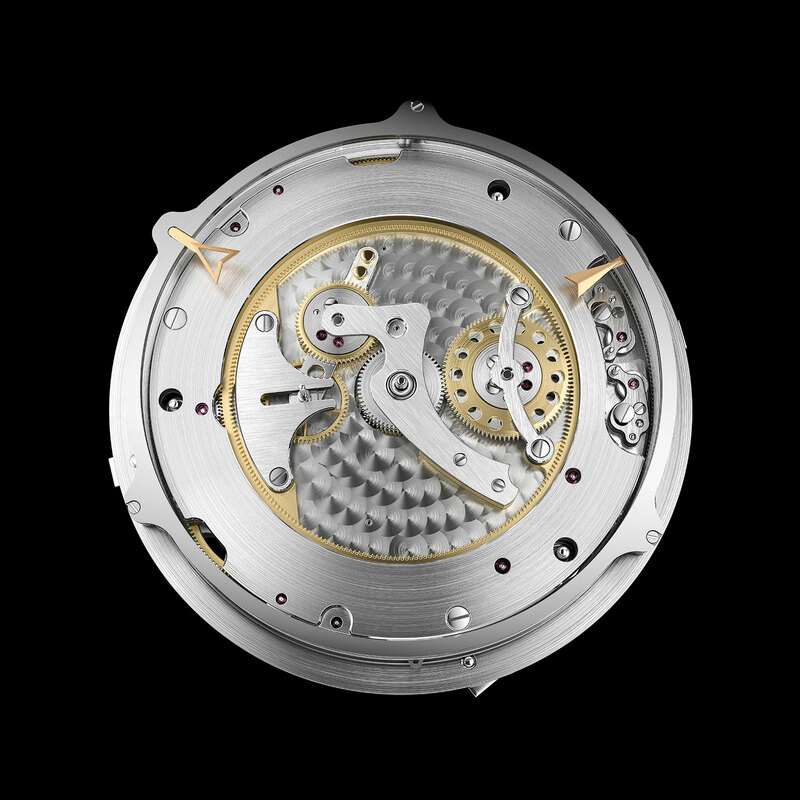 The module is significantly larger than the base movement, adding almost 10mm to its diameter, which explains the discrepancy between the apparent movement size seen from the back and the case. The cal. 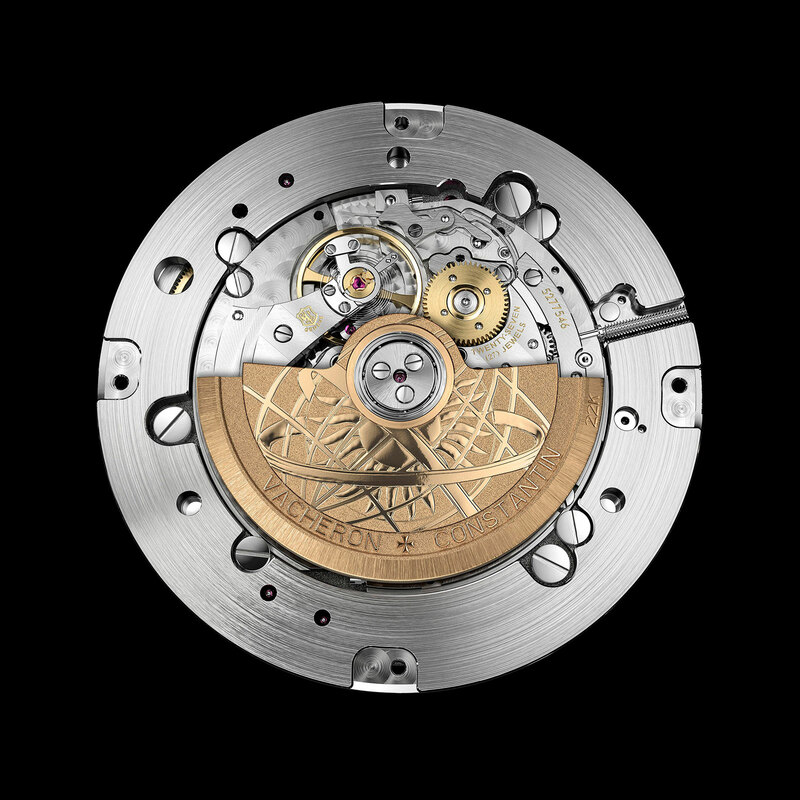 2460 is Vacheron Constantin’s flagship automatic movement, so it boasts details like the finely finished and complex hacking seconds mechanism. It’s made up of a series of levers just beside the balance wheel, with one beak-shaped lever touching the rim of the balance when the crown is pulled out for time-setting. The decoration is also finely executed, right down to the smallest details, including polished countersinks for jewels, screws and pins. 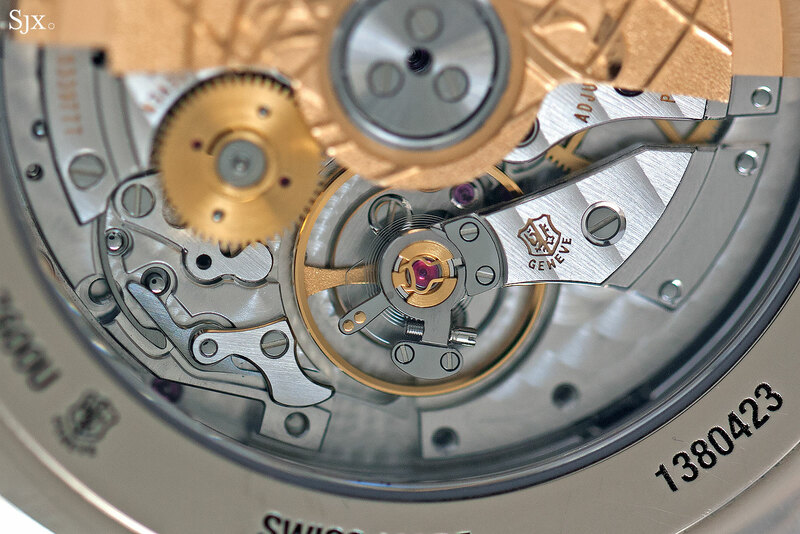 The particularly watch pictured is a prototype, so there is lint and stray tool marks on the movement. 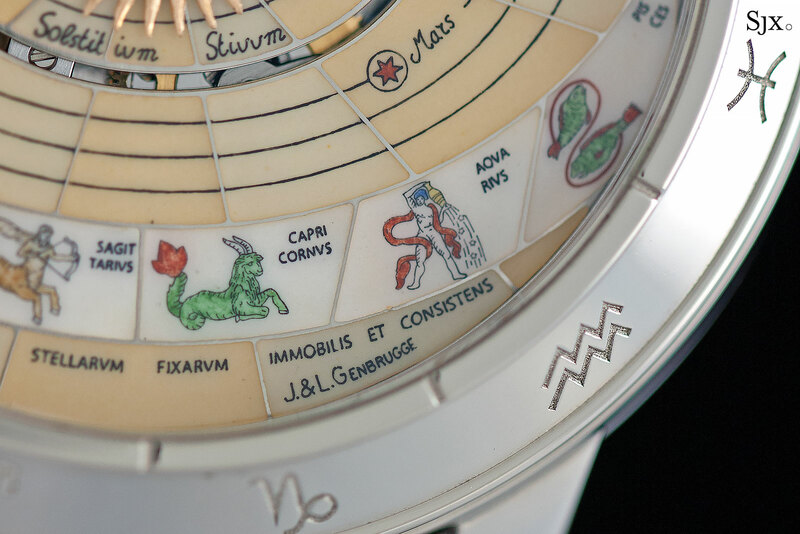 Just as unusual as the complication are the three dial styles offered for the Celestial Spheres. Although all three have exactly the same layout and function, each is notably different. 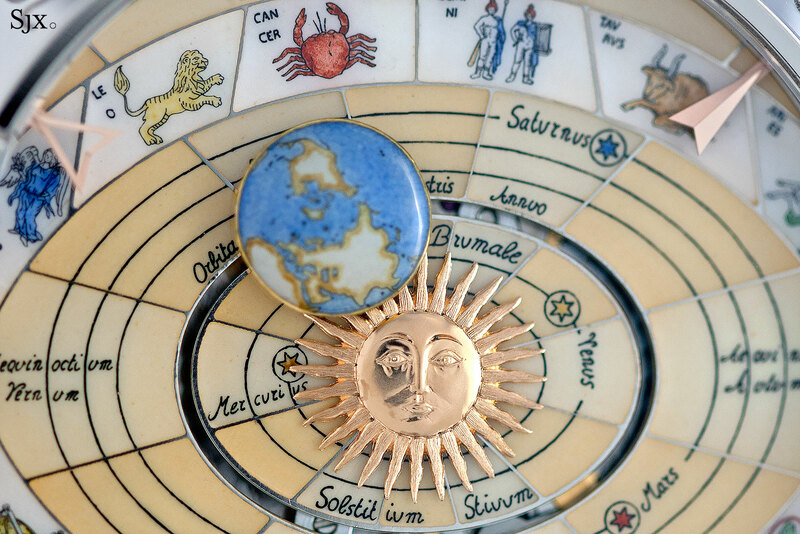 The most expensive, being the most intricately decorated, but also the least interesting, is the Celestial Spheres in grand feu enamel. 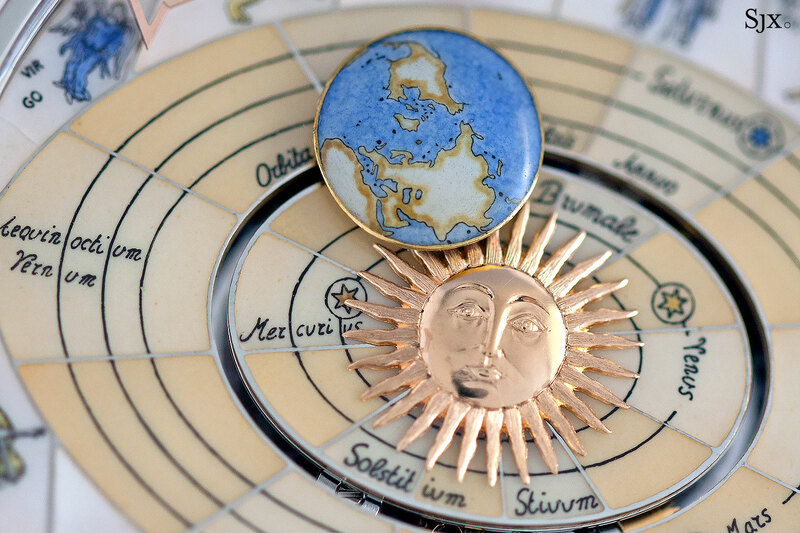 The Earth is a small globe finished both champlevé and miniature enamelling, while the dial is lavishly decorated in miniature enamelling. Surrounding the Sun are concentric lines that show the orbits of the five planets closest to the Sun, followed by tiny depictions of the 12 signs of the zodiac. 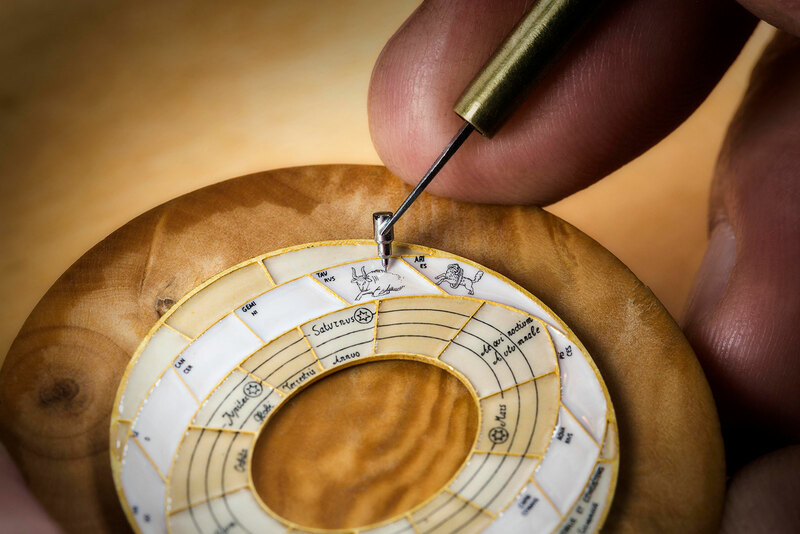 Starting with a dial disc of 22k gold, the cells of the dial are first filled with enamel to form the base for the motif. The miniature enamelling is then done with a stencil and quill pen for the outlines, followed by a tiny brush to apply the colour and fill the outlines. It’s then baked repeatedly in an oven, to set each section of the dial, before being lapped and polished. The process takes over a month. 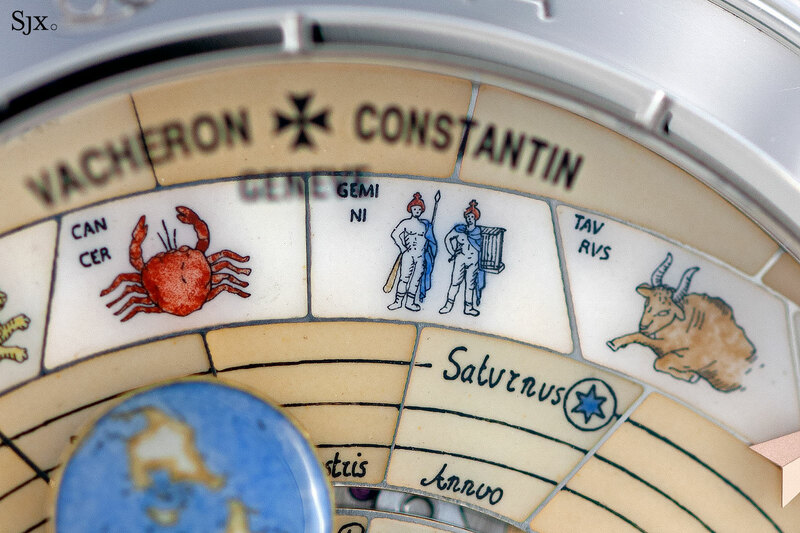 That being said, the technique of miniature enamelling is not as arduous as the miniature painting of the style practiced by the famous artisans of Geneva like Suzanne Rohr, but the dial is nonetheless finely executed, offering tremendous detail up close. Notably, it is produced by Belgian enamel workshop J&L Genbrugge, made up of the husband and wife team Jean and Lucie. 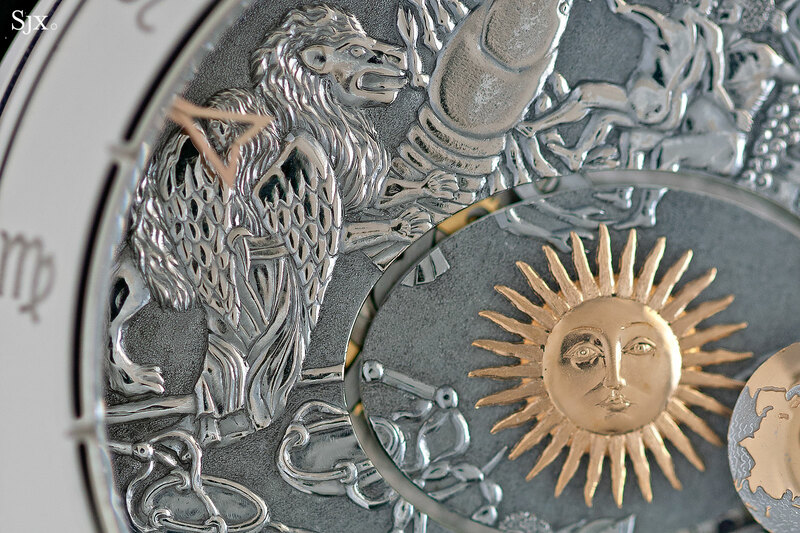 Their partnership with Vacheron Constantin has been a durable one; the pair were also responsible for the enamel dials of the Mercator watches from the mid 1990s. The reason I say this is the least interesting of the trio is twofold. Firstly, the enamel dial is composed of general pale colours that are close to most skin tones, which means it doesn’t stand out much. Secondly, enamel dials are relatively common in this segment of watchmaking. 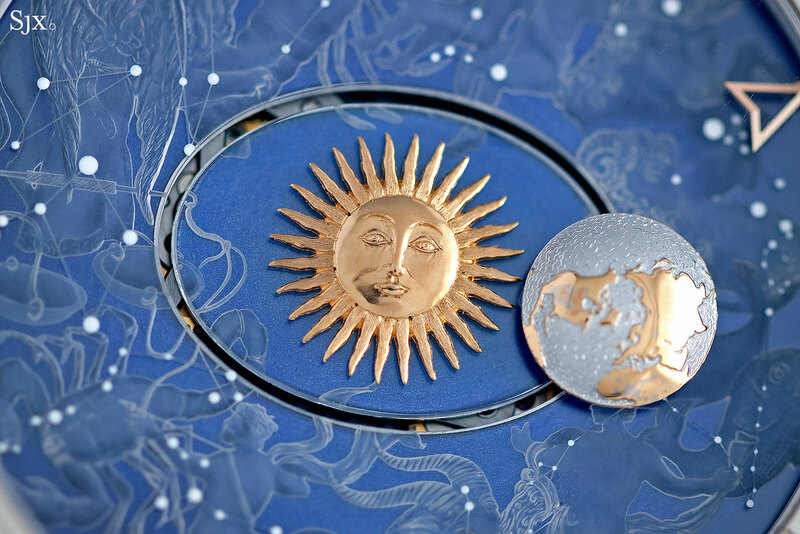 The hand-engraved Celestial Spheres has more visual impact. 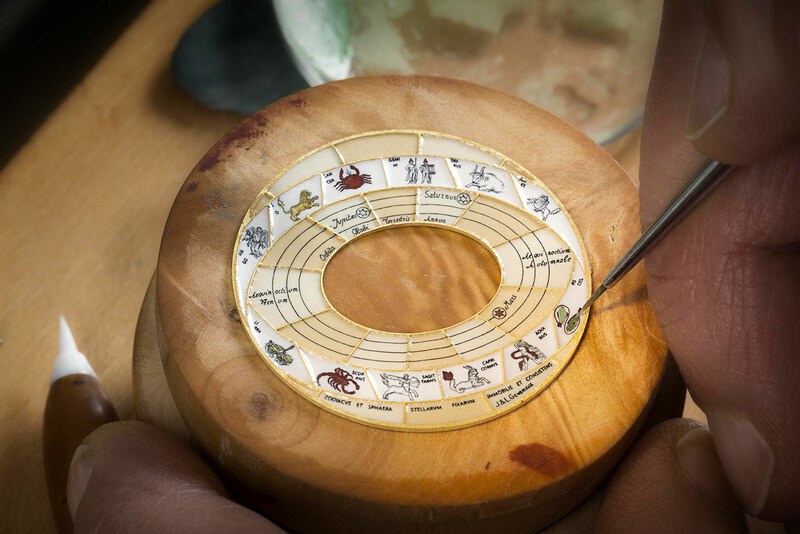 Here the 12 signs of the zodiac are spread out in an intricate circle around the dial, arranged in such a way they almost seem to be combating each other. It’s reminiscent of relief carvings of the ancient world. All the engraving is done with detail and finesse. 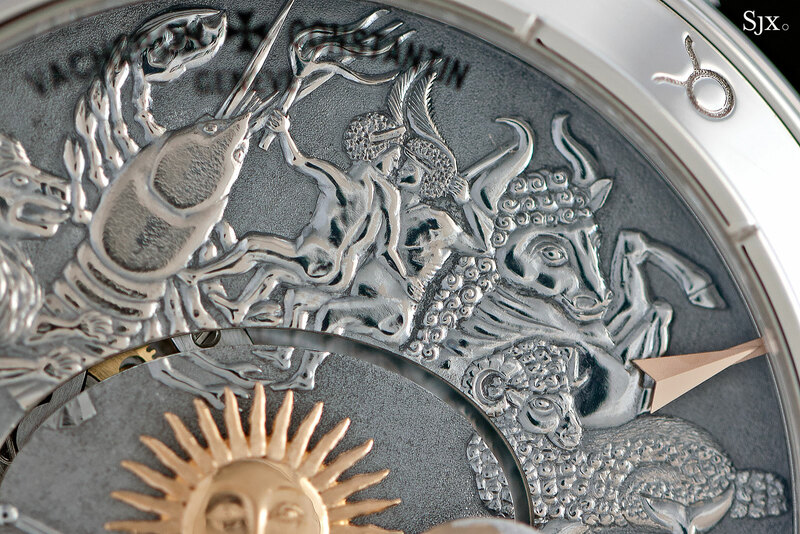 The dial is solid 18k white gold, with the engravings done in polished relief against a dimpled surface. And the third dial version is the least expensive, but the most compelling. 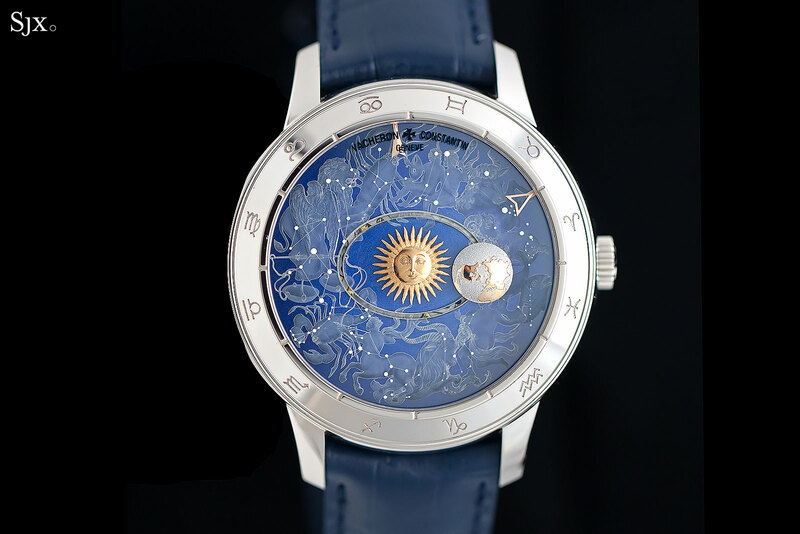 This features a dial that is made up of two levels: a lower dial plate of 18k gold that’s hand-painted in blue, and an upper dial plate that’s made of clear sapphire engraved on its underside. 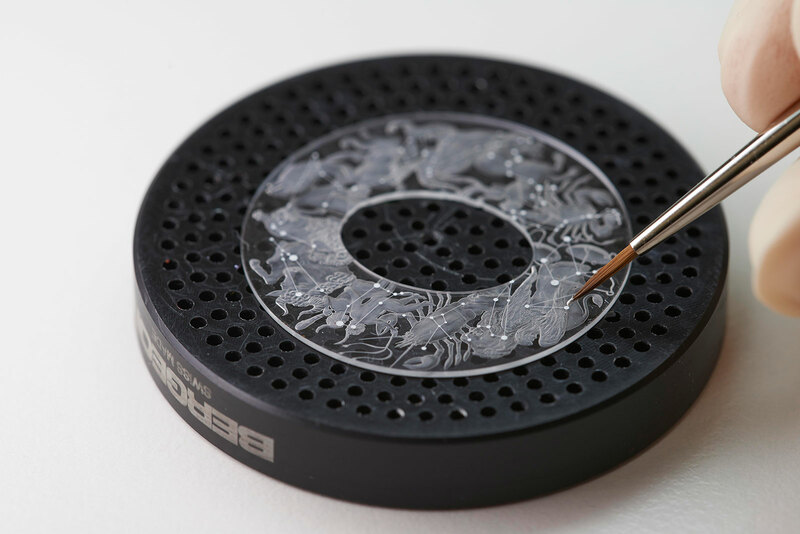 The sapphire dial plate is first engraved with laser, and then refined and finished by manual engraving. 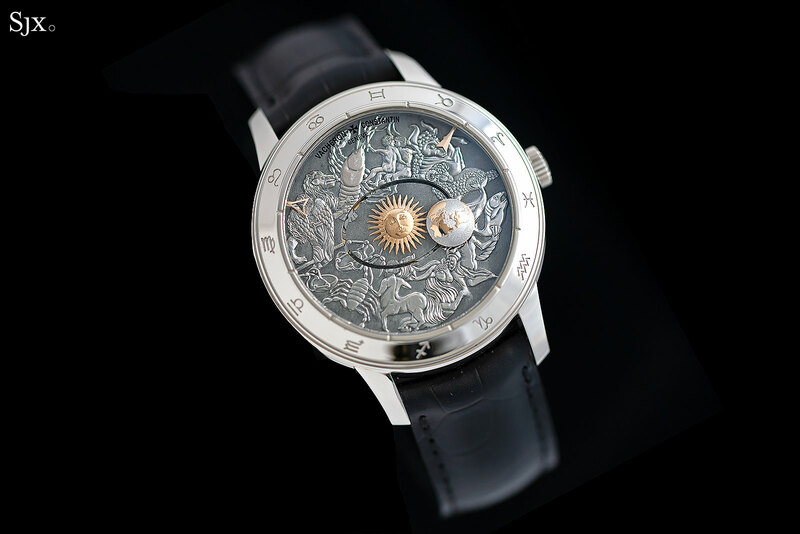 Because the motif is executed with a combination of laser and hand-engraving, this is the most affordable of the trio. 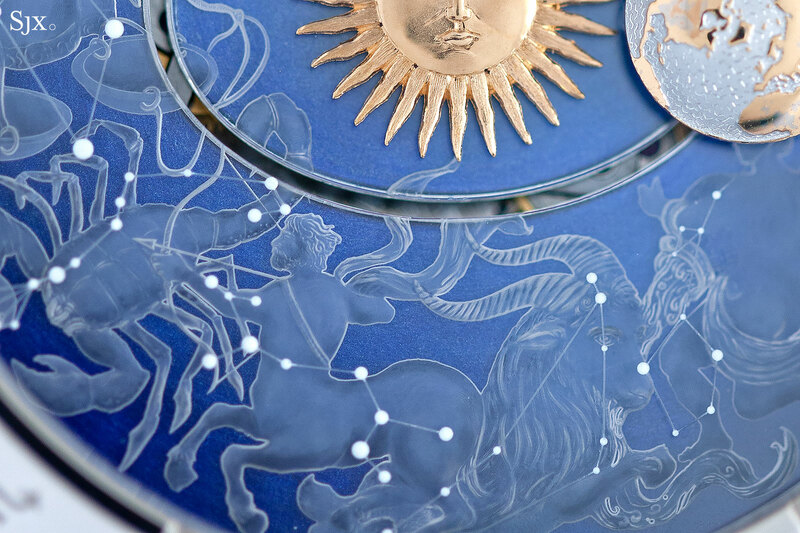 Resembling engraved crystal glassware, the result is an intricate motif that show all of the zodiac signs, and their equivalent constellations in the night sky. 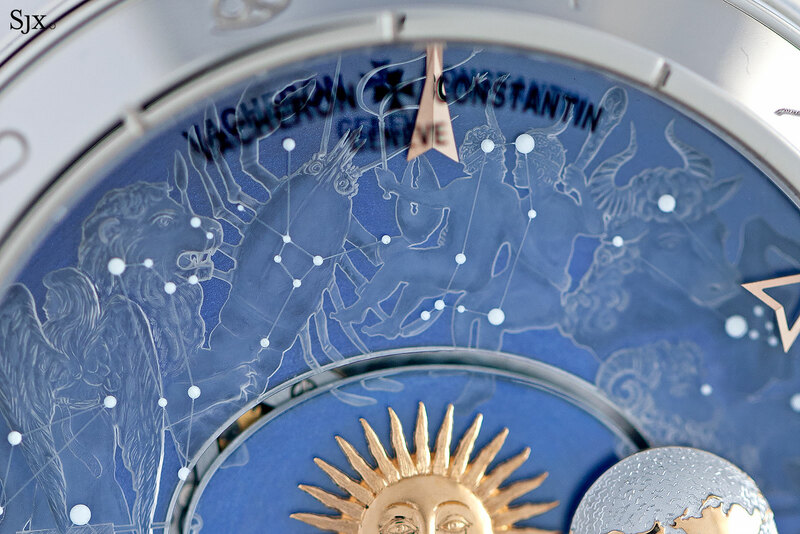 The constellations, in turn, are painted with Super-Luminova, so they glow in the dark. It is extremely enticing on the wrist, day or night. All three versions have the same 18k white gold case that’s 43mm wide and 12.9mm thick. That size is the only weakness of the watch; while the dials are delicate and detailed, the watch feels chunky. But the size is not an affectation, the movement inside is 37mm in diameter and 6.7mm high, as a result of the large module that contains both the peripheral time display and “tropical” gear train for the Earth display. And not a shortcoming but a necessity with such watches is the fact that the accuracy of the astronomical display is never matched by the owner setting the mechanism. 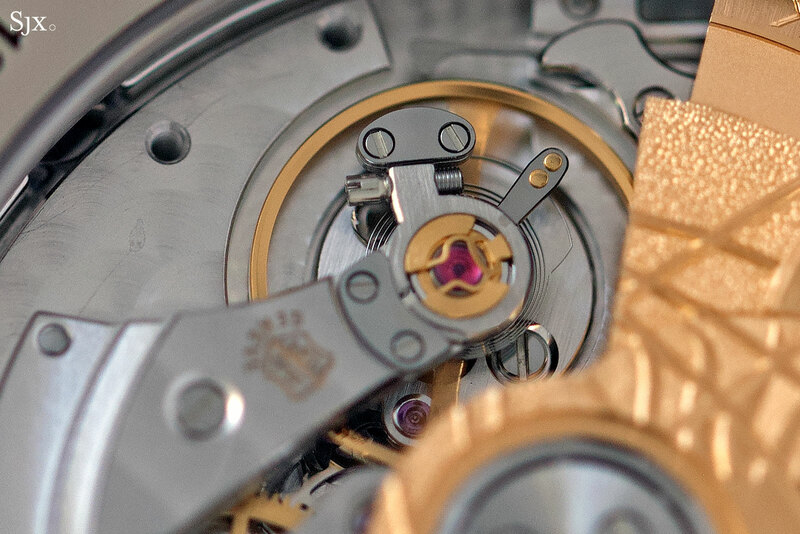 Even though the mechanism behind it is exceptionally accurate, the size of the dial and user error when operating the crown means that the accuracy of 1-day-in-8000-years is academic. Nevertheless the Celestial Spheres is a gorgeous timepiece that is both mechanically clever and impressively executed, with a straightforward function that is easily understood. 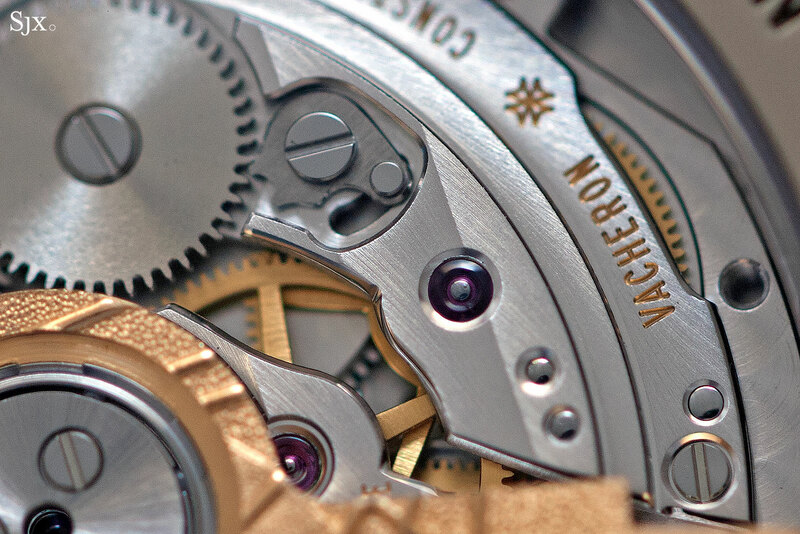 They are available only at Vacheron Constantin boutiques. Update April 5, 2019: Image of the under-dial mechanism added, along with a paragraph on the elliptical orbit of the Earth display.